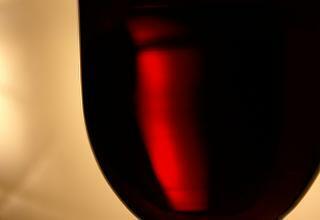 Merlot has gained popularity among wine drinkers. This plummy red wine made from one the top varietals of grapes grown in Bordeaux, France, blends well with others and produces delicious wines all on its own. It is also the single grape gracing the world's most expensive wine, Château Pétrus. Like many other red wine varietals, Merlot most likely traces its history back to France. You can find Merlot in the early history of the Bordeaux region, and experts believe it is a mutation of the Cabernet Franc grape, and closely related to Cabernet Sauvignon and Carménère. Early history discusses Merlot as far back as the 18th century, and in the 19th century it was commonly found in Left Bank vineyards. The late 1960s brought several rotted and tainted vintages of Merlot grapes, leading the French government to order new Merlot plantings between 1970 and 1975. Now it is a popular varietal throughout the world, with large concentrations found in Bordeaux, California, Washington State, South America, and Australia. The name means "young blackbird," which describes the deep purple color of Merlot grapes, as well as the fondness birds have for this varietal. The wines resulting from the grapes have medium tannins that soften well with age, and the character of the wine changes depending on climate and terroir. Merlot wines grown in cool climates may be redolent with the flavors of strawberries and cedar, while warm and hot climates produce Merlot wines with chocolate or dark plum flavors. Merlot tends to have an herbaceous flavor, as well, along with what some experts term "barnyard," which in the small amounts present in Merlot add a surprising complexity to the wine. Alone in a wine, Merlot tends towards soft and supple flavors. When blended with Cabernet Sauvignon and other varietals, Merlot adds softness, depth, and complexity to the wines. You can find Merlot in wines labeled eponymously, as well as blended with other Bordeaux varietal grapes. Many varietals labeled as Merlot may have a small amount of Cabernet Sauvignon blended for structure. In the Bordeaux region, Left Bank producers blend small amounts of Merlot with Cabernet Sauvignon to add softness and complexity. On the Right Bank, however, Merlot is the star. Two of the world's most expensive wines, Château Pétrus and Château Le Pin, are made almost exclusively of Merlot and offer silky textures and deep complexity in highly concentrated wines. Australian, Chilean, and other Southern Hemisphere Merlots are concentrated, ripe powerhouses. While they still contain Merlot's characteristic softness, the wines remain richer and fruitier, yielding flavors of fruitcake, cocoa, and dried fruits. Other flavors common in merlot include cassis, berries, cherries, and leather. For a great example of South American Merlot, try the wines from Concha Y Toro. For Australian Merlot, try Clarendon Hills. In the United States, California and Washington lead the pack in producing Merlot. Merlot has grown in its planting in these two states since the 1970s. While initially used as a blending grape with Cabernet Sauvignon and the Bordeaux-style Meritage blends, producers began toying with it as a single varietal. Some have been successful, but there are many disappointments to be found as well. Often, in a reverse paradox, small bits of Cabernet Sauvignon or Cabernet Franc are blended to toughen up Merlot's structure. Duckhorn Vineyards and Pride Mountain Vineyards are two noteworthy Merlot producers from California. In Washington, Merlot stands second to no other state. The best places commanding attention are wines from Columbia Valley and Walla Walla. A good place to start might be at Gary Figgins' Leonetti Cellar or Northstar Winery with Merlots showing balance, flavorful fruit, and finesse. Another terrific Washington State Merlot-based wine to try is the fabulous Spring Valley Uriah. As you might expect, the easy Merlot style leans to less acidity than Cabernet Sauvignon, giving it a higher lushness factor. Acidity is always one factor to consider when pairing food with wine but there are no hard and set rules. Merlot works with soft or hard cheeses, pastas, roast chicken, grilled or roasted meats, vegetarian dishes, casseroles, and salads. It also makes a good Thanksgiving wine, and works well with salmon and lamb. Many wine drinkers love Merlot above all other wines, while others avoid it at all costs. If you are among those who do not enjoy Merlot, you may just not have yet tried the right Merlot. After all, there's a reason Merlot is the key grape in one of the world's most expensive and collectible wines. That's because under the right conditions, Merlot wines provide drinkers with a lush, powerful wine experience.